Ithaca Beer Co. opened in late 1998. Dan Mitchell had been thinking about opening a brewery in the Finger Lakes for several years. While checking out one brewing system in Texas that did not meet his plans, he found the equipment at a second location and it was shipped the New York. Ithaca Brewing has become recognized as one of the up and coming craft brewers in the northeast. 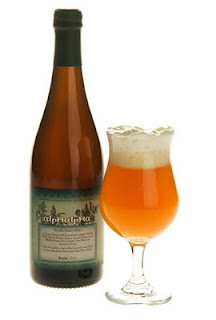 Ithaca AlpHalpHa Double Honey Bitter is brewed with organic barley, New York grown Cascade hops, local alfalfa honey and Cayuga Lake water. Pours a bright golden color with a thick rocky head. Plenty of floral hop aroma, crisp bitter flavor and dry finish. The brew is part of Ithaca's limited release Excelsior! Series and weighs in at 8.5 percent alcohol by volume.